BMW has this week unveiled a new electric bike in the form of the BMW Active Hybrid e-bike, which will soon be available priced at €3,400 or roughly $4,000. Equipped with both a 504-Wh battery and 250-W motor inside its hydroformed aluminium frame, the electric bike is capable of providing enough pedal assistance for up to 100 km or 62 miles on a single charge with 90 Nm or 66 lb-ft of torque. BMW has made it easy for the rider to adjust the degree of pedal assistance with ease via the new display which offers four different power modes (from ECO (+50%) to TURBO (+275%)) can be selected up to a maximum 25 km/h (16 mph). Plus, the micro USB socket and Bluetooth enabling users to connect their smartphone and use the companion application. 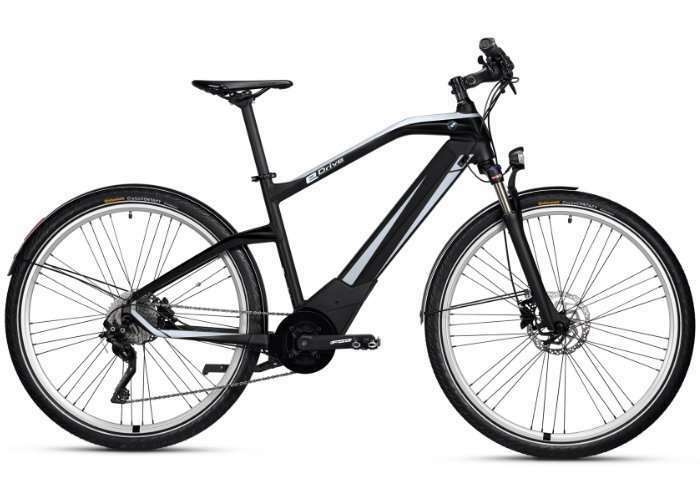 Check out the video below for a quick overview of the bike and its detailing, the new Active Hybrid e-bike is now available at select BMW dealers. The BMW Active Hybrid e-bike packs an electric motor neatly away inside the frame in an effort to maintain an elegant “sporty silhouette” and can switch its pedal-assist on and off at the touch of a button. The frame’s profile is accentuated by the familiar BMW “bullneck”, which exudes energy and forward-surging presence, and the exclusive Frozen Black and Arctic Silver paintwork. The LED light integrated into the aluminum mudguard over the rear wheel maximizes safety and adds a further design flourish.